This Land Rover Discovery Sport has a dependable Intercooled Turbo Premium Unleaded I-4 2.0 L/122 engine powering this Automatic transmission. NAVIGATION SYSTEM (SD CARD BASED), HEATED WINDSCREEN -inc: heated washer jets, FUJI WHITE. *These Packages Will Make Your Land Rover Discovery Sport SE the Envy of Onlookers*FIXED PANORAMIC ROOF, EBONY/EBONY, PARTIAL LEATHER SEAT TRIM -inc: outer grained leather and inner obsidian embossed fabric, EBONY HEADLINER, CONVENIENCE PACK -inc: Powered Gesture Tailgate, Passive Keyless Entry, HomeLink Garage Door Opener, Auto-Dimming Interior Rear View Mirror, BLACK DESIGN PACK W/19 ALLOYS & CONTRAST ROOF -inc: Black Styling Exterior, black fender vents, black Discovery bonnet and tailgate script, Black Mirror Caps, Black Grille, Wheels: 19 5 Split Spoke w/Gloss Black Finish Style 521, Tires: 19, Narvik Black Contrast Roof, 5+2 SEATING PACK -inc: 1 3rd row USB, GVWR: 2,660 kgs (5,864 lbs), 2 3rd Row Seats, 3rd Row Cool Vents, Window Grid Diversity Antenna, Wheels: 18 9 Spoke (Style 109), Wheels w/Silver Accents, Valet Function, Trip Computer, Transmission: 9-Speed Automatic, Transmission w/Driver Selectable Mode and CommandShift Sequential Shift Control w/Steering Wheel Controls, Towing Equipment -inc: Trailer Sway Control, Tires: 18. * Visit Us Today *Test drive this must-see, must-drive, must-own beauty today at Jaguar Land Rover Lakeridge, 280 Achilles Rd, Ajax, ON L1S 7S3.This Land Rover Discovery Sport has a powerful Intercooled Turbo Premium Unleaded I-4 2.0 L/122 engine powering this Automatic transmission. NAVIGATION SYSTEM (SD CARD BASED), HEATED WINDSCREEN -inc: heated washer jets, FUJI WHITE. * Drive Your Land Rover Discovery Sport SE in Luxury with These Packages*FIXED PANORAMIC ROOF, EBONY/EBONY, PARTIAL LEATHER SEAT TRIM -inc: outer grained leather and inner obsidian embossed fabric, EBONY HEADLINER, CONVENIENCE PACK -inc: Powered Gesture Tailgate, Passive Keyless Entry, HomeLink Garage Door Opener, Auto-Dimming Interior Rear View Mirror, BLACK DESIGN PACK W/19 ALLOYS & CONTRAST ROOF -inc: Black Styling Exterior, black fender vents, black Discovery bonnet and tailgate script, Black Mirror Caps, Black Grille, Wheels: 19 5 Split Spoke w/Gloss Black Finish Style 521, Tires: 19, Narvik Black Contrast Roof, 5+2 SEATING PACK -inc: 1 3rd row USB, GVWR: 2,660 kgs (5,864 lbs), 2 3rd Row Seats, 3rd Row Cool Vents, Window Grid Diversity Antenna, Wheels: 18 9 Spoke (Style 109), Valet Function, Trip Computer, Transmission: 9-Speed Automatic, Transmission w/Driver Selectable Mode and CommandShift Sequential Shift Control w/Steering Wheel Controls, Towing w/Trailer Sway Control, Tires: 18, Tire Specific Low Tire Pressure Warning. 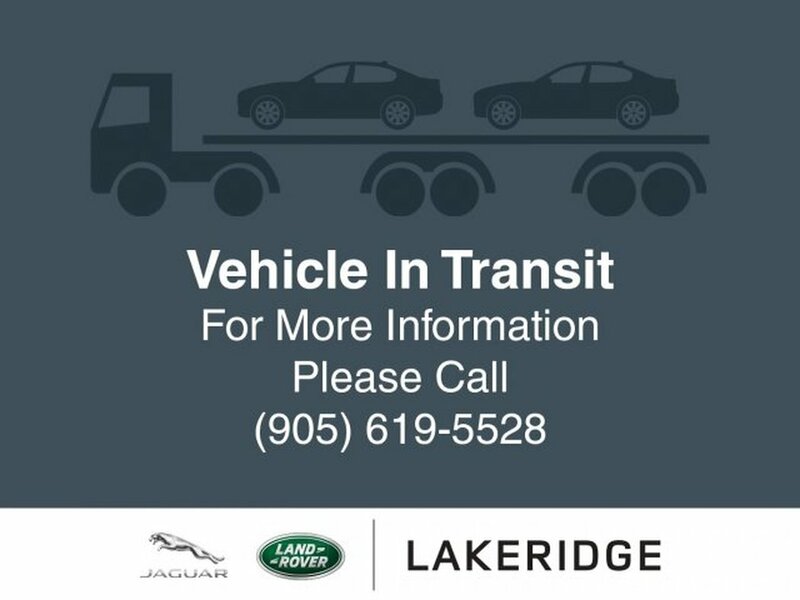 * Visit Us Today *A short visit to Jaguar Land Rover Lakeridge located at 280 Achilles Rd, Ajax, ON L1S 7S3 can get you a trustworthy Discovery Sport today!Prices include all fees except licensing and HST.